1 oz 2018 American Eagle Silver Coin | ?? 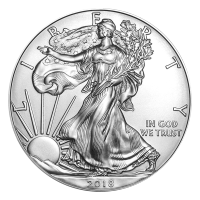 Purchase your 1 oz 2018 American Eagle silver coin from our store for the lowest price online. This iconic silver coin, which is only made in a 1 oz size, has become an American legacy since its inception in 1986 and is widely considered to be one of the most striking bullion coins on the market. The patriotic piece on the obverse of the coin was artfully crafted by Adolf A. Weinman for use on coins circulated as far back as 1916 and it depicts magnificent Lady Liberty, olive branch and star spangled banner in hand, marching into the rising sun. Also on the coin’s obverse, you’ll see the ‘Liberty’ legend, along with the ‘In God We Trust’ motto and the ‘2018’ year of release. Originally, in 1986, these coins were marketed with the hopes of driving up both silver price and popularity since production had for so long exceeded strategic need, that the Defence’s Stockpile was full to bursting. Own your own tribute to the history of the enduring nation of America by ordering your 1 oz 2018 American Eagle silver coin today. 正面 Walking Liberty with a rising sun and the words "Liberty In God We Trust 2018"
反面 A heraldic eagle behind a shield clutching arrows in it's left talon and an olive branch in it's right talon with thirteen five-pointed stars above and encircled by the words "United States of America 1 oz Fine Silver One Dollar"
Walking Liberty with a rising sun and the words "Liberty In God We Trust 2018"
1 oz 2018 American Eagle Silver Coin Purchase your 1 oz 2018 American Eagle silver coin from our store for the lowest price online. This iconic silver coin, which is only made in a 1 oz size, has become an American legacy since its inception in 1986 and is widely considered to be one of the most striking bullion coins on the market. The patriotic piece on the obverse of the coin was artfully crafted by Adolf A. Weinman for use on coins circulated as far back as 1916 and it depicts magnificent Lady Liberty, olive branch and star spangled banner in hand, marching into the rising sun. Also on the coin’s obverse, you’ll see the ‘Liberty’ legend, along with the ‘In God We Trust’ motto and the ‘2018’ year of release. The reverse design is no less iconic, with the classic heraldic eagle and shield design, complete with 13 stars (to represent the original colonies of the great nation) and the age old ‘E pluribus Unum’ banner (Out of Many, One). The United States legend also graces the reverse, along with the coin’s weight, purity and denominational value. Originally, in 1986, these coins were marketed with the hopes of driving up both silver price and popularity since production had for so long exceeded strategic need, that the Defence’s Stockpile was full to bursting. Own your own tribute to the history of the enduring nation of America by ordering your 1 oz 2018 American Eagle silver coin today.